We recently launched a new Recruiter Activity feature for jobseekers that is available on every job posting as well as under the “Applied Jobs” section. The idea behind this was to create a more transparent environment to help candidates in their job search and to provide them more information about the action being taken on applications by recruiters. In short, the Recruiter Action score tells you how many applications the recruiter has taken an action on (such as viewed, downloaded, rejected, shortlisted etc) and gives you an idea if other candidates may have been contacted. For example, in the below sample, you’ll notice that the Marketing Manager – Business Strategy/Consulting (8-12 yrs) position was posted on 27th June, 2014 by Ranjana Deopa who is the Director at Altavis (an executive search firm). As you can see, she received a total of 94 applications out of which she’s taken an action on 88 of them. 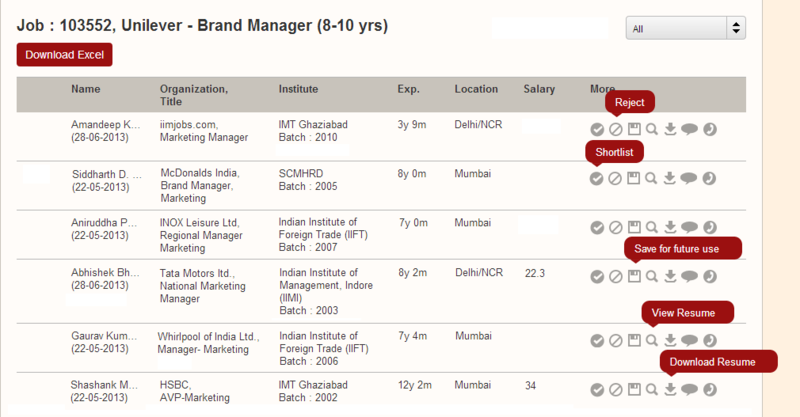 You can also view these details under your “Applied Jobs” section. Not only does this give candidates substantial information about the recruiter, it also helps put a face behind the posting. Moreover, candidates also have the option of connecting with recruiters via their social media accounts (all you need to do is click on the name of the recruiter and you’ll be redirected to a detailed recruiter profile page). The idea is to clear the apprehensions of those candidates who believe that no one is looking at their applications (and especially those who see Applied/Sent against their application status). Thanks to our simple recruiter dashboard system, recruiters can get an immediate idea of the profile of all candidates who have applied for a particular position. In a lot of other cases, we’ve noticed candidates applying to jobs which are months old and they then feel aggravated for not getting a response. Again, from our experience, we’ve seen that what usually happens is that the recruiter takes an action on those resumes that he/she received within the first few weeks and then in all probability, the position gets closed. In this case, they will hardly take the trouble to view (or even reject) your application months down the line. To sum up, always check the date of the job posting before applying. If you see your status as “Applied/Sent”, do check the recruiter activity for that posting. Chances are the recruiter might not have taken an action on your application (for reasons mentioned above) but this does not mean other relevant candidates are not being contacted. So did you find the Recruiter Activity feature useful? Do let us know. Next Next post: What is meant by relevant work experience? Jobber's Park Why did we launch Recruiter Activity?